Mexican Summer is turning 10!! 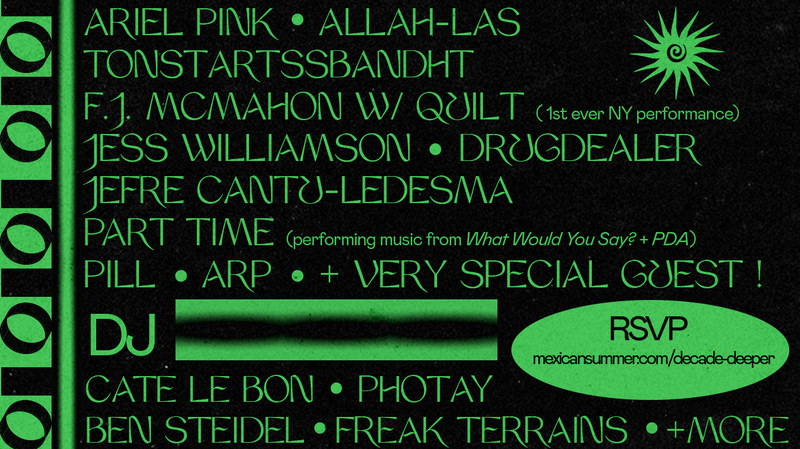 To celebrate the first ten years of living, breathing, and believing, Mexican Summer will host a homegrown, all day event in its Brooklyn backyard on Saturday, November 17. While almost impossible to bring the entire family back together, the label welcomes a wide representation of its artists to the table to help harmonize in birthday song. On two stages in Red Hook institution Pioneer Works, the day of celebration will variously feature Jefre Cantu-Ledesma, Arp, Pill, Drugdealer, Tonstartssbandht, the first ever New York performance of FJ McMahon and Quilt, Jess Williamson, Allah-Las, Part Time performing the music of What Would You Say? and PDA, Ariel Pink, and a very special, Swedish guest. All ticket sales from the event will benefit Pioneer Works, Mexican Summer’s longtime friend and collaborator, and an intrepid, non-profit voice for the the arts in New York. Recognizing its roots, Mexican Summer: A Decade Deeper, a limited edition LP featuring unreleased music from Ariel Pink, Connan Mockasin, Drugdealer, and many others, will be available at the ten year event and direct from the label thereafter.